French beauty chain Sephora, renowned for their perfumes and cosmetics, launches a brand new limited edition eyeshadow palette on the 7th of November 2017. Sephora partnered with Online Star Register (OSR) to launch the Mixology Galaxy Palette, in an endeavor to bring eyeshadow users an experience unlike any other in the world. Collaborating with Online Star Register, known for their Name A Star personalized gift, Sephora enhanced the Mixology Galaxy Palette with a extraordinary feature. During the launch of the eyeshadow palette, famous French beauty Vloggers will receive their own named star. Their Mixology Galaxy Palette will come with a colored galaxy card. The card highlights the vlogger’s star name, its coordinates, and provides a link to the Star page at Online Star Register. 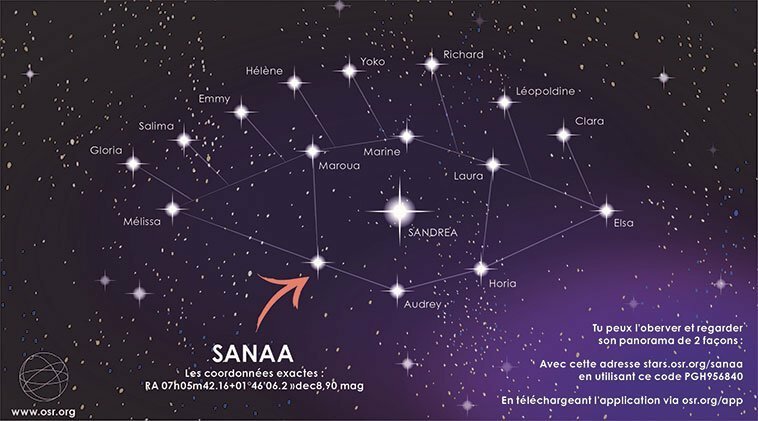 Together, all the named stars form an “eye constellation” in the night sky. Would you like to name a star for someone yourself? Have a look at our amazing gifts! With Online Star Register’s experience personalizing stars, Sephora saw the opportunity to make this palette special. Sephora reached out to Online Star Register and asked for a sample of the OSR Gift Pack. This gift pack includes a personalized star registration, certificate, a card with a personal message, and several features dedicated to making the recipient feel truly special. Not only was Sephora impressed with the product, they appreciated the professional and courteous service of the OSR customer service representatives. Their combined efforts connected the most unique gift in the world with the quality of Sephora’s cosmetics. Would you like to team up with OSR just like Sephora? Please don’t hesitate to contact us! Sandrea, a famous French beauty vlogger, helped Sephora with the development of the eyeshadow palette. The 18 colors in the palette are galaxy inspired colors, with names such as Stellar, Lunar, Asteroid, Sun, Stardust, Universe, Planet and Atmosphere. Each of these colors can be mixed and blended. Sephora fans can view their favorite beauty vlogger’s star at Online Star Register. Be sure to visit these beauty vloggers and leave them a message in the guestbook on their star page! Would you like to win a Mixology Galaxy Palette? Check out OSR @ Instagram! Name a star for someone special!